Felix Faust is a fictional supervillain who appears in stories published by DC Comics. The character first appeared in 1962 as an adversary of the Justice League of America. Felix Faust first appears in Justice League of America #10 and was created by Gardner Fox and Mike Sekowsky. The first recorded whereabouts of the mighty sorcerer now known as Felix Faust is from c. 5,000 BC, at which time he appeared in the legendary African empire of Kor. The king of Kor was Nommo, the prime wizard of his time and the guardian of the mystic power called the Flame of Life. The evil sorcerer battled Nommo, attempting to use the Flame's power to his own corrupt ends. Nommo then called the Flame of Life into himself, defeating the sorcerer by banishing him to another dimension. In the mid-1920s, a madman and aspiring magician named Dekan Drache stumbled upon the dimension and managed to open a portal to it. Released, the sorcerer destroyed Drache’s soul and entered his body. However, though alive on Earth once more, the sorcerer found his powers drastically reduced. Obsessed with restoring his mystic might, the sorcerer read the story of how the man called Faust had sold his soul to the devil for supernatural powers, and decided to do the same. Inspired by the story's main character, the sorcerer now called himself Felix Faust and began a never-ending quest for mystical knowledge. Felix Faust first appeared in Justice League of America, vol. 1, #10 (March 1962), when he tried to regain some of his lost magical abilities by contacting the Demons Three, three fictional demons in the DC Universe. These three demons were brothers who ruled the galaxy a billion years ago before being banished by beings known as the Timeless Ones. The Demons Three have tried to return time and again, summoned by Felix Faust and others, their attempts always foiled by the Justice League. Felix Faust tried to summon the power of the Demons Three by possessing three artifacts: the Green Bell of Uthool, the Silver Wheel of Nyorlath, and the Red Jar of Calythos, that had been created by the Demons, and which the Timeless Ones could not destroy or move from Earth. Pre-Crisis, they claimed a spell using the artifacts would free them in 100 years, but in that time the caster of the spell would be able to command them. To do this he takes control of the JLA with the Demons' help, who find and defeat the artifact's guardians and bring them to Faust who begins the spell, but Aquaman is able to break the spell by distracting him using his control of fish. The sorcerer is then taken to prison, and the JLA soon after find out about the Demons' escape and re-imprison them. Pre-Crisis, he was a member of the Crime Champions, a trio of Earth-1 criminals who teamed up with a trio of Earth-2 villains to commit crimes, then escape to the other world using a vibratory device accidentally discovered by the Fiddler. Felix Faust robbed $1,000,000 from a sunken ship and escaped Aquaman, the Martian Manhunter and the Atom. Later, the Earth-2 Crime Champions impersonated the Earth-1 Crime Champions using the Wizard's magic, in an attempt to trap the JLA. The Fiddler impersonated Felix Faust. They robbed Casino Town (evidently based on Las Vegas), and 'Felix Faust' contacted the JLA. The Fiddler was, oddly enough, able to cast spells like Faust and battled Aquaman, the Martian Manhunter, and the Atom. The real Felix Faust, while robbing a fair on Earth-2, was confronted by Green Arrow, the Martian Manhunter, and the Atom but, despite casting a spell that made them spin in midair, he was knocked out by the Atom. When the Crime Champions were fully defeated, Doctor Fate, Batman, and the Earth-1 Flash defeated Faust. Over the years, Faust's hunger for magical power proved very costly to him. He had bargained his soul away for knowledge on many occasions, only to buy it back later when his acquisitions failed to help him meet his goals; every time, he would end up worse than before. Eventually, he found it difficult to find any mystics willing to purchase his tarnished soul. Finally, he tried to trick Neron into giving him power by offering the pure soul of an innocent girl he murdered in lieu of his own. Unfortunately for him, Neron saw through the ruse and punished Faust by setting the girl's vengeful spirit upon him. For a time, Faust's damned soul languished in a hellish plane for magicians who had abused or ignored the laws of magic. During the event known as 52, a voice from within the helm of Doctor Fate speaks to Ralph Dibny and promises to fulfill his desires if he makes certain sacrifices. Dibny journeys with the helm through the afterlives of several cultures, where he is cautioned about the use of magic and sees Felix Faust. He is told about their deals by the voice. The Spectre promises to resurrect his late wife Sue in exchange for Dibny's taking vengeance on her murderer, Jean Loring, but Dibny is unable to do so. At Nanda Parbat, Rama Kushna tells Dibny, "The end is already written." In Doctor Fate's tower, Dibny begins the spell to resurrect Sue, puts on the helmet of Fate, and shoots it, revealing Felix Faust, who was posing as Nabu. Faust planned to trade Dibny's soul to Neron in exchange for his own freedom. Ralph reveals that he was aware of Faust's identity for some time, and that the binding spell surrounding the tower is designed to imprison Faust, not to counter any negative effects of the spell. Neron appears and kills Dibny, only to realize too late that the binding spell responds only to Dibny's commands: through his death Ralph has trapped Faust and Neron in the tower. One year after Infinite Crisis, with Neron having already escaped, Faust escapes from the Tower of Fate with the help of Black Adam through the aid of a revived Isis, and contacted Red Tornado's soul which was still adrift after fighting Alexander Luthor alongside Donna Troy, the Green Lantern Corps, and their allies. Working with Dr. Impossible, Professor Ivo, and Solomon Grundy, Faust posed as Deadman and offered the android his heart's desire: a human body. The Tornado accepted, and Faust bound his soul into his new body. Faust and his allies then stole the Red Tornado's original android body for their own purposes. After lending his concealment spells to Cheetah, Faust joined with Talia al Ghul in order to corrupt yet another hero: Black Alice. Faust offered Alice power, wealth, a place in the Secret Society of Super Villains, and the resurrection of her mother, but Alice refused, sent Faust out of town, and tapped into his powers so she could perform the resurrection herself. After this, Faust seemed to rejoin the Society. On the cover of Justice League of America (vol. 2) #13, it shows Felix Faust as a member of the latest incarnation of the Injustice League. As a member of Cheetah's Secret Society of Super Villains, Felix Faust played a part in the creation of Genocide when he used his magic to animate the collected soil samples. Felix Faust has been shown retaining his control over Isis even after he used her powers to free himself from Fate Towers by creating a doorway. Forced to keep Isis under a powerful sedation spell at all times, he's implied to regularly sexually abuse the young goddess. Still unable to communicate, Isis manages to signal her husband Black Adam to her aid via a trail of Isis flowers. Once Black Adam discovers Isis he forces Faust to free his wife, who in retaliation castrates Faust with her bare hands before leaving, sparing his life. In The New 52 (a 2011 reboot of the DC Comics universe), Felix Faust is sporting a more macabre, emaciated appearance. He captures Doctor Mist after the hero attempts to infiltrate his cult, leading to the Justice League Dark being sent in to rescue him. After Faust is knocked out by Black Orchid, the heroes find a map leading to the Books of Magic in his possession. During the Forever Evil storyline, Felix Faust is among the villains recruited by the Crime Syndicate to join the Secret Society of Super Villains. In the pages of Forever Evil: Blight, Felix Faust and Nick Necro are seen torturing Mindwarp for Ultraman, eventually killing him, in an attempt to create rechargeable specimens, having previously done so with Sargon the Sorcerer. When John Constantine's group arrives in the Nanda Parbat temple, they eventually come across the project that Nick Necro and Felix Faust has been working on. They see Black Orchid, Cassandra Craft, Shade, the Changing Man, Enchantress, Blackbriar Thorn, Blue Devil, Papa Midnite, Sargon the Sorcerer, and Zatanna being held for the use in the Crime Syndicate's weapons program to use against the entity that destroyed their world. Constantine realizes that Nightmare Nurse is not herself, actually Necro in disguise. The two fight and Constantine is able to stop Necro in order to try and free Zatanna. Before he is able to, his is captured by Felix Faust. Constantine senses his team getting closer and hopes they will help him, not realizing that they have been captured too in order to be used for the project. The character appears as one of the villains refusing to be hired by Henry Bendix in order to kill Midnighter and Apollo. Felix Faust is unschooled in physical battle, and a sub-par hand-to-hand combatant. He is, however, a master sorcerer able to control vast magical power to affect reality itself. When he first appeared, Faust was unique amongst magicians of his caliber, requiring books or scrolls of spells to focus his powers. However, in recent appearances he seems to have overcome this disadvantage. When Felix Faust first appeared in Justice League of America #10, he was using the Necronomicon, the occult book from the stories of H. P. Lovecraft, to summon the Demons Three. In a later appearance, the title of the work was changed. Of the two, Sebastian's soul was bartered to the demon Nebiros, but the power Felix asked for was granted to Sebastian instead. As a result, the father-son relationship has been adversarial. Sebastian has generally acted as a hero, working with the Outsiders, Justice League, and Sentinels of Magic. In Captain Carrot and His Amazing Zoo Crew!, the anthropomorphic funny animal-dominated alternate world of Earth C-Minus parallels Pre-Crisis Earth-One. It has a heroic Just'a Lotta Animals (which parallels Earth-One's Pre-Crisis Justice League of America) as well as "funny animal" supervillains like "Feline Faust", an evil cat sorcerer. Feline Faust later reappeared in the 2007 miniseries Captain Carrot and the Final Ark, where it was disclosed that he had created Dark Alley, an evil counterpart of the Zoo Crew's resident mage, Alley-Kat-Abra, and framed the original for the murder of her teammate Little Cheese. Felix Faust made additional (albeit out of continuity) appearances in Justice League Adventures #32 attempting to control various League members. He would then appear in Justice League Unlimited #26, helping Black Manta to conquer Atlantis. Felix Faust is among the mind-controlled villains defending Krona's stronghold when the heroes assault it in issue #4. Felix Faust appears in The Super Powers Team: Galactic Guardians episode "The Case of the Stolen Powers" voiced by Peter Cullen. He was shown in a prison with the Penguin as his cellmate. Faust was about to cast a spell to escape by transferring Superman's powers into himself, but Penguin seized the opportunity, stole the Superman powers, and broke out easily, leaving Faust behind. Faust later stripped Penguin of Superman's powers, and gained them himself after he had his spirits apprehend Penguin. He also proved vulnerable to Kryptonite when Firestorm changed part of his burnoose into it. Wonder Woman used her lasso to force Felix Faust into relinquishing Superman's powers. The two were again jailed in the same cell much to the dismay of both. Felix Faust as seen in Justice League. 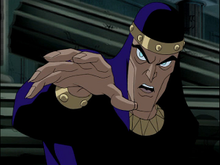 Felix Faust later appears in the 2000s animated series Justice League voiced by Robert Englund (notable for playing Freddy Krueger). Originally a professor of archaeology with a heretic interest in magic and the dark arts, he becomes a sorcerer prior to being expelled from the university where he taught, using his sorcery to exact his revenge on those who scorned him. In "Paradise Lost", Faust transforms the resident Amazons of Themyscira into stone with a Gorgon talisman to force Wonder Woman to gather the parts of a key to open the gate to Tartarus, domain of Hades, making a pact with the god for "ultimate knowledge" in return. Wonder Woman manages to get the help of her friends from the Justice League in her quest for the key. Once Batman discovers Faust's intentions, the League decide not to give Faust the key without a fight. However, Faust gets the key and escapes. Faust manages to free Hades and even provides him with Hippolyta as an offering. Hades, however, betrays Faust and causes him to begin aging rapidly, turning Faust into a withered old man on the spot and claiming to him that "Ultimately, pain and suffering are all mankind will ever know". Faust recovers enough to attempt to attack Hades, who was busy fighting Hippolyta and her allies, from behind with a spell, but rather than weaken Hades, it transforms him to his more powerful state. Soon after Wonder Woman destroys the key and sends Hades back to Tartarus, Faust ages into dust and is sucked into the underworld. In the Justice League Unlimited episode "The Balance", Tala manages to recover Felix's soul and contain it in a mirror. He tricks Tala into chanting a spell, freeing Faust and trapping Tala in the mirror. Faust then takes control of the Annihilator, an extremely powerful magical automaton forged by the Greek god Hephaestus, taken by the Justice League and then stolen by Cadmus, and uses it to take over Tartarus, overthrowing Hades, but at the same time, creating a terrible unbalance between the realms of the living and the dead. Eventually, Wonder Woman and Shayera free Hades, and together they destroy the Annihilator and defeat Faust once and for all, leaving Hades to content himself torturing Faust's soul forever. Felix Faust appears in Batman: The Brave and the Bold in the episode "Evil Under the Sea!" voiced by Dee Bradley Baker. He plotted to open Pandora's box only to be defeated by Batman and Atom. He is later shown in "Day of the Dark Knight!" as an escaping inmate from Iron Heights Penitentiary only to be stopped by Batman and Green Arrow. Felix Faust later returns in "The Criss Cross Conspiracy!" as a paroled ex-convict, opening a magic shop. He is seduced by, and helps the vengeful Batwoman in swapping bodies with Batman so she can have her revenge on the Riddler. Batman, in Batwoman's body, later returns to Faust's store, and convinces him to escape the police and help him switch back bodies. After Faust, the Riddler, and Batwoman are all arrested, he continues to be smitten by her, despite Batman reminding him that for most of the time it was him in her body, and therefore, she has no feelings for him, but Faust disregards this and says: "Well, nobody's perfect!" In "Triumvirate of Terror", Felix Faust is seen as a member of the Legion of Doom when it came to a baseball game against the Justice League International. Dee Bradley Baker reprises his role as Felix Faust in the Young Justice episode "Misplaced". He is recruited by Klarion the Witch Boy to perform a powerful spell alongside him, Wizard, Wotan, and Blackbriar Thorn in order to cause a necessary distraction by making all of the adults in the world disappear where they cast the spell from Roanoke Island. He and the others are defeated by Red Tornado, Zatara and Batman whilst Klarion is defeated by Doctor Fate and the team. Felix Faust appears in the Justice League Action episode "Hat Trick", voiced by Jon Cryer. Orchestrating a mannequin attack on a mall, Felix Faust steals Zatanna's hat and brings it to the ruins at the Hebrides where he makes his plans to summon the demon Ghast in order to regain his youth. When Batman, Zatanna, and Etrigan arrive, Felix Faust has just finished summoning Ghast who restores Felix Faust's youth. While Batman and Etrigan the Demon work to stop Ghast before he reaches the mainlands, Zatanna uses her magic to fight Felix Faust which ends with her using the chains she conjured to bind him. After Zatanna uses her hat to make Ghast disappear back to his dimension, a bound Felix Faust tries to flee only to trip on the rabbits that emerged from the hat prior to Ghast's summoning. He then quotes "Why did it have to be rabbits?" Felix Faust appears in Constantine, portrayed by Mark Margolis. His plan involved stealing the souls of various Brooklyn residents to increase his own dark powers. Faust is portrayed as an older man who spent most of his life serving, and living in the shadows of, the greatest magicians of his generation. Faust's magical powers increase dramatically because of the "rising darkness", an ongoing plot in "Constantine". Felix Faust appears in the animated film Justice League Dark, portrayed by Enrico Colantoni. Felix Faust appears as a boss in DC Universe Online voiced by Brian Jepson. Felix Faust is first seen in Metropolis' Chinatown District where he tries to corrupt the souls there. The players find Felix Faust in Madame Xanadu's Shop where he has captured Zatanna. The players managed to free Zatanna who helps to defeat Felix Faust. He is later seen in collaboration with Black Adam in a plot to siphon souls at Gotham University in order to revive Isis. It turns out to be a trick as Felix Faust drains Black Adam's powers and uses them to raise Isis as a zombie while he escapes. Felix Faust is served by Archmagents, Giant Mummies, Khet Scarabs, Magent Warlocks, Magent Witches, Mini Scarabs, Mummies, Swarm Scarabs, and a Soulless Lord. Felix Faust appears as a playable character in Lego DC Super-Villains. ^ "Constantine: Mark Margolis To Play Felix Faust". comicbook.com. ^ Perry, Spencer (July 26, 2016). "Justice League Dark Featurette Reveals Matt Ryan Returns as Constantine!". Superhero Hype. ^ Vejvoda, Jim (November 15, 2016). "JUSTICE LEAGUE DARK: TRAILER DEBUT FOR R-RATED DC ANIMATED MOVIE". IGN.